6 days ago · Meet the Investigator: Yi Lin, M.D. 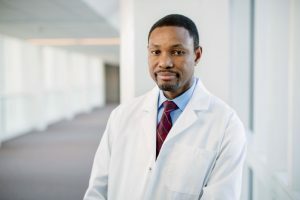 , Ph.D.
At the Mayo Clinic Cancer Center, hundreds of researchers dedicate their professional lives to reducing the burden of cancer. Each one has a unique story. In this video, Yi Lin, M.D., Ph.D., a hematologist at Mayo Clinic in Rochester, Minnesota, talks about her cellular therapy research. This article was originally published in the March 2019 edition of Forefront. The Early Cancer Therapeutics Group at Mayo Clinic offers patients whose cancers haven’t responded to standard chemotherapy or other treatments the opportunity to join an early-phase clinical trial of a potential new treatment. Early-phase clinical trials (phase I) determine safe dosage levels and safe methods of treatment delivery. 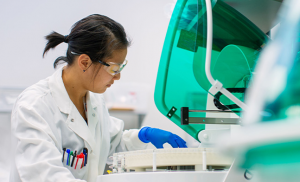 A phase I clinical trial might be the first time a cancer drug or treatment is used in people. These clinical trials offer investigational cancer solutions for cancer therapy resistance — trials for patients whose cancers haven’t responded to standard treatments. 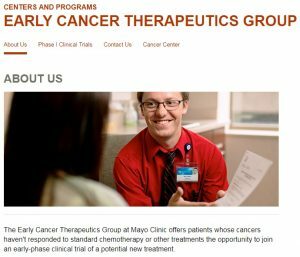 The Early Cancer Therapeutics Group website provides information for patients interested in participating in Mayo Clinic’s early-phase clinical trials (phase I). Mayo Clinic has a new website through which patients and referring providers can learn about its early-phase clinical trials for cancer. The website provides an overview of services offered by the Early Cancer Therapeutics Group, including details on who can be seen, what patients can expect from a visit to Mayo Clinic, and a list of current Early Cancer Therapeutics clinical trials. For more information on trials available through the Early Cancer Therapeutics Group, or to refer a patient, please contact the Mayo Clinic Cancer Center Clinical Trials Referral Office at 855-776-0015 (toll-free). Learn more about cancer clinical trials at Mayo Clinic. 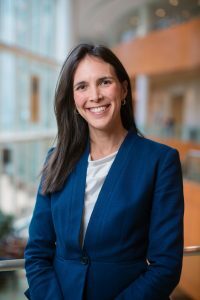 Nov 1, 2018 · Meet the investigator: Roxana S. Dronca, M.D. Oct 30, 2018 · Have You Read the September 2018 Issue of Forefront Magazine? Read about Mayo Clinic’s cutting-edge cancer research in Forefront magazine. No? This is your chance! 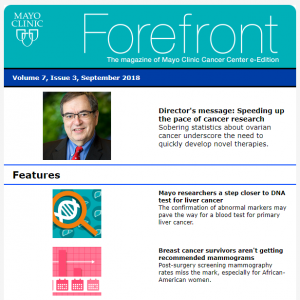 Forefront is the complimentary magazine of the Mayo Clinic Cancer Center. Published in online and email newsletter editions quarterly, Forefront highlights Mayo Clinic’s cutting-edge cancer research. A message from Mayo Clinic Cancer Center director, Robert Diasio, M.D. View the latest online edition. View the latest email newsletter. 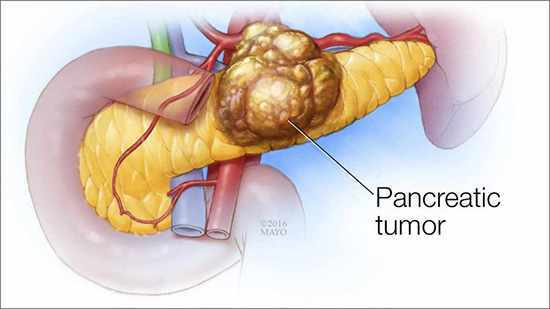 The Hepatobiliary SPORE is part of the Mayo Clinic Cancer Center’s Gastrointestinal Cancer Program, which aims to develop and pursue innovative science that will lead to practice-changing outcomes that reduce the incidence of gastrointestinal cancers and increase survival. Breast cancer survivors are not getting the recommended level of post-surgery screening, according to a study published in the May 2018 issue of the Journal of the National Comprehensive Cancer Network (JNCCN). Contrary to screening recommendations, mammography rates decline over time as women get further out from their breast cancer diagnosis; African-American women in particular were less likely to receive the recommended amount of screening. 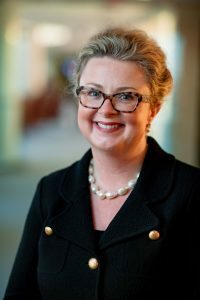 The study was led by Kathryn Ruddy, M.D., M.P.H., a Mayo Clinic medical oncologist in Rochester, Minnesota and co-chair of the Mayo Clinic Cancer Center Survivorship Cross-disciplinary Group. Dr. Ruddy is also a member of the National Comprehensive Cancer Network Clinical Practice Guidelines in Oncology Panel for Survivorship. The researchers followed 27,212 patients for a median of 2.9 years after breast cancer surgery (excluding those who had bilateral mastectomy, for whom mammograms are not needed), with 4,790 patients remaining in the study cohort for at least 65 months. The retrospective analysis used the OptumLabs Data Warehouse, containing claims from privately insured patients and Medicare Advantage enrollees from across the United States. One year out from surgery, they found 13 percent of the survivors had not undergone any breast imaging. The number without a mammogram within the past year rose to 19 percent by five years after surgery. Only 50 percent of the patients who were followed for at least five years had at least one mammogram each of those five years. The study also found that African-American breast cancer survivors were less likely than their white counterparts to receive mammograms according to the recommended schedule. This may contribute to higher mortality rates for that population, given that recurrence of cancer in the breast is considered to be a major driver for poor prognosis in African-American women. While the reasons for this disparity aren’t clear, limited access to genetic testing could be a factor. This story is based on a May 24, 2018 news release provided by the National Comprehensive Cancer Network. In a 2017 article published in Oncotarget, Ferga Gleeson, M.D., M.B., B.Ch., a specialist in gastroenterology and hepatology at Mayo Clinic’s campus in Minnesota, describes a targeted DNA next-generation sequencing (NGS) study conducted at Mayo Clinic. The goal of the Mayo study was to assess tumor cytology genotype diversity via endoscopic ultrasound (EUS), and to survey for potential adverse prognostic biomarkers and the prevalence of mTOR pathway variants. 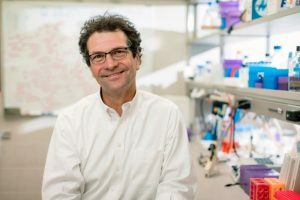 “The premise of our research is that molecular tumor genotyping via EUS fine-needle aspiration has the potential to determine a specific tumor’s eligibility for targeted molecular therapy or perhaps immunotherapy, and to facilitate triage of patients into clinical trials based upon their respective tumor genotype,” explains Dr. Gleeson. This study provides evidence that cytology-based tumor genotyping can reveal a broad spectrum of genetic variants, including possible adverse prognostic biomarkers, reflective of an aggressive phenotype. It also demonstrated the prevalence of potential predictive biomarkers for mTOR pathway inhibitor sensitivity. “We are hopeful that such molecular profiling and patient stratification will become a vital aspect of future efforts to provide individualized and targeted therapy to enhance outcomes for appropriately selected patients,” explains Dr. Gleeson.